After the latest round of international tariffs, the US Commerce Department has launched a probe around the national security of uranium imports into the country. The investigation will target the entire uranium space, from the mining sector to energy, defense and industrial use. This latest move by the Trump administration could result in more tariffs, continuing to heighten fears of a looming global trade war. The ramifications of a uranium-specific tariff would be especially large on the energy sector as uranium is the key fuel for nuclear power plants. Currently the US only produces five percent of the uranium its energy sector consumes, with the vast majority being imported from Canada, Kazakhstan, Russia, Australia and Uzbekistan. 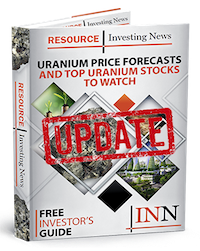 The probe, which was announced Wednesday (July 18), is the result of a January petition filed by two US uranium mining companies, UR-Energy (TSX:URE) and Energy Fuels (TSX:EFR). The miners requested the Commerce Department to investigate the matter under Section 232 of the 1962 Trade Expansion Act. A similar inquiry in the name of national security was launched earlier this year around imports of steel and aluminum. The findings resulted in a stiff 25 percent duty on imports of the industrial metals from the European Union, Canada, Mexico, China and Japan. There is currently another investigation underway focused on the threat to security posed by auto imports. The price of uranium has only recently begun to regain some of its strength following the 2011 Fukushima accident, which drove demand down when Japan took all its nuclear reactors offline. Production of U308 was also reduced after 2011 and took a further blow late last year when the largest uranium producer in North America, Canadian-based Cameco (TSX:CCO), reduced its output. While some worry the current probe will end in new tariffs, a similar uranium examination was launched in the US in 1989, citing the same legal provisions. The results of the late 80s investigation found foreign shipments didn’t threaten American national security.